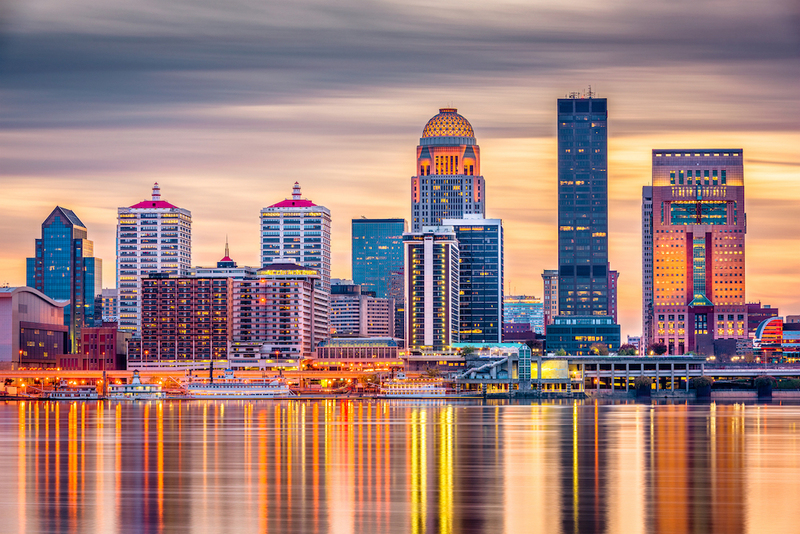 Whether you call it Derby City, Bourbon City, or River City, Louisville, Kentucky is home to many unique companies and great people that create a spirit that can’t be found anywhere else. While Louisville is the largest city in Kentucky, the tight-knit neighborhoods throughout town shape Louisville to feel like a smaller city with all the benefits of living in a larger city. Quiet neighborhoods, parks, and great school systems are not far away from bustling downtown and other areas of Louisville that have a lot of local restaurants and attractions like the Highlands, NuLu, and St. Matthews. If you’re relocating to Louisville, or just want to learn more about our eccentric city, below are 11 things you should know about Louisville, Kentucky. Just barely making the cut to be considered part of the South, Louisville has come to have a unique fusion of Southern Charm, especially in the Spring with all the Derby festivities, while greatly valuing a forward-looking attitude as a whole. Louisville International Airport is conveniently located off the Watterson Expressway, making Louisville a convenient city to live in and easy enough to get out of when you need a vacation! If one word could be used to describe Louisville, it would probably be “local.” There are local farmers markets, which are ramping up for the busy Spring and Summer seasons, local restaurants that often use food from local farmers, and a plethora of local coffee shops, bookstores, and more. The diverse and eclectic neighborhoods ensure that you will find a place that offers everything you’re looking for in the community you settle in. Old Louisville is home to mansions dating back to the 1800’s. Central Park in Old Louisville is the main attraction in the Spring and Summer and provides free entertainment in the warmer months including the Kentucky Shakespeare Festival. NuLu is the newest neighborhood in Louisville that has exploded in popularity in the last few years. It’s the place to go to support local businesses, shops, and restaurants. St. Matthews is where the malls are, The Highlands is a great place to hang out on the weekends, and Germantown is home to the famous Nords Bakery. Just as the Highlands, and other neighborhoods in the heart of Louisville, offer unique attractions, there are several communities that lie on the edge of the greater Louisville Metro that provide a slower pace of life where you can live, raise your families, and grow. We have recently been building in these communities more and have no hesitations in recommending them to our clients. Prospect is “at the crossroads of rural and urban living,” has small-town charm, and distinctive natural beauty preserved in the four parks that surround the area. The land is also teeming with natural wildlife and there are ordinances against hunting and the mistreatment of these animals. Find out more about Prospect here. Located within Prospect, Kentucky, Norton Commons isn’t just a neighborhood, it’s a lifestyle experience with all the “classic conveniences of a mixed-use community.” Restaurants, retail shops, pools, and parks surround the neighborhood that creates a unique living experience. We’ve compiled essential neighborhood information that can be found on our community page here. Just south of Shelbyville Road lies 250 acres of land surrounded by plenty of natural amenities including woods, three lakes, a winding creek, and more than 70 acres of green space. This community is an exciting new custom-home development and includes modern amenities like a clubhouse, a swimming pool, adult swimming pool, and playground. We built three Homearama homes in Shakes Run in 2015 and are very familiar with the community. See our community page here for more information on Shakes Run. Sustainability is incredibly important here and Catalpa Farms is the first Conservation Community approved in Jefferson County. This is also the site of Homearama 2018 and is where we have concentrated our building recently. See our Catalpa Farms community page for more information. These are still just a few of the neighborhoods in Louisville! No matter what neighborhood you land in, Louisville is an accessible city and you’re usually never more than 20-30 minutes away from your next destination. You can find more information and resources on louisvilleky.gov, gotolouisville.com, and liveinlou.com. We have recently had the privilege of working with families who have relocated from Atlanta, Georgia and Denver, Colorado to the Louisville area for their jobs. Below, you can read a testimony from one of our recent homeowners, Emma and Chad Johnson, who moved from Atlanta to Prospect. They bought an existing home and we did some modifications to fit their specific needs. We can create your dream home built to your exact specifications and lifestyle. Check out more about the communities we’ve built in and if you’re relocating and ready to build your home in Louisville, we’d be happy to help answer any questions that should make this transition easier. You can also download our Custom Homebuilding Checklist to get started on your dream home.